Absinthe – Tomato Town organically grows heirloom tomatoes in the greater Kansas City area as well as Johnson County, Leawood, Lenexa, Olathe, Shawnee, Merriam KS, Independence MO and Kansas City Missouri, KCMO. Varieties include: Cherokee Purple, Brandywine, Stupice, Carbon, Black Krim, Black Cherry, Yellow Pear, Absinthe and Aunt Ruby’s German Green. Though named for the hallucinogenic spirit that reportedly prompted Vincent van Gogh to remove his ear, this Absinthe is harmless. 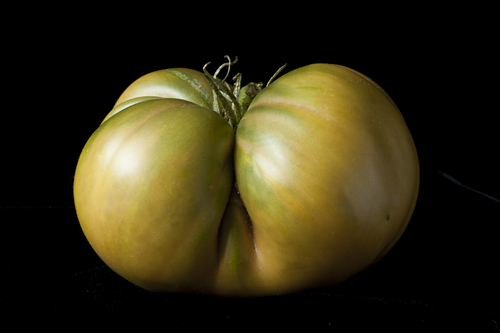 Packed with flavor, this fruit made it into the top ten best tasting tomatoes at this year’s annual KCTT Tomato Tasting. 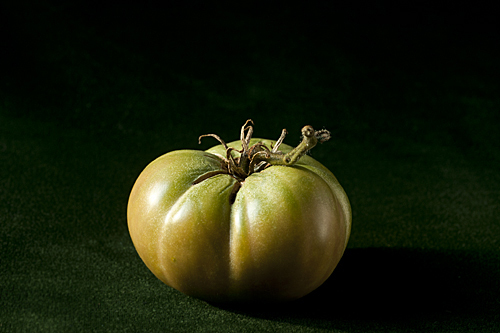 Created from a cross between Emeraude, Aunt Ruby’s German Green, and Brandywine, the characteristic green color has charmed us here at TomatoTown. This specimen was one of the few we harvested this year, which would have been disappointing in an ordinary year. We hope to bring Absinthe back next year to study how the variety fares in normal Midwestern temperatures. This entry was posted on Thursday, September 15th, 2011 at 9:07 am. It is filed under TomatoTown Favorites, Varieties. You can follow any responses to this entry through the RSS 2.0 feed.